In Cumbria we provide teaching to infant and primary schools where we work with children between the ages of 3 and 11 to equip them with the life skills they need to make healthy choices. 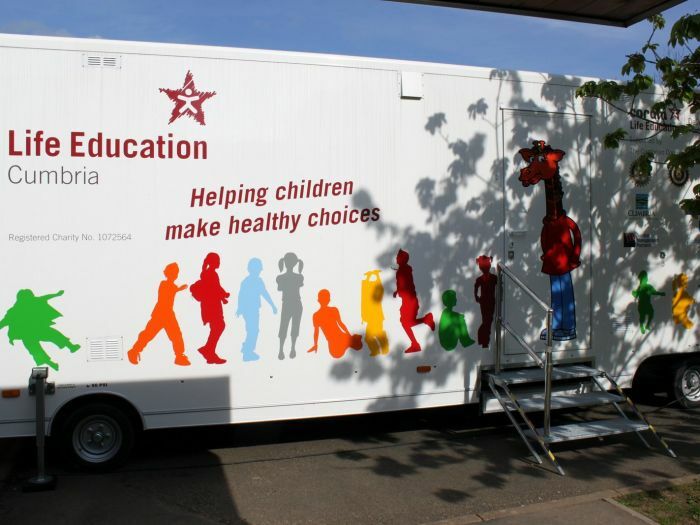 We have two mobile classrooms supported by our Educators Jackie Baker and Alison Rae, which tour the schools throughout the year from Longtown to Barrow and Brough to Maryport. No school is too large or too small as we are keen to visit them all and are warmly welcomed by the parents, teachers and of course the children. They are all excited by the prospect of visiting the mobile and all the wonders it contains including ‘Harold the Giraffe’. 4x4 vehicles to perform the delicate manoeuvres required. We currently charge the schools £375 per day but keep this to an absolute minimum, particularly at a time of tightening budgets.